The Blog is Back! The 2013-14 Season is underway! After a couple years of silence I've decided to bring back the blog! It's been a crazy couple of years and most of the news from the kennel has been posted through Facebook, and even though it is one of the best ways to share the dogs and I's adventures, I have gotten many requests to get the blog back up and running so here we are! The 2013-14 season is ramping up and I figured this would be a great time to fill you all in on what is going on at Wild and Free. Currently I am in MN on the final leg of what will be a 3-week trip to the Lower 48. In the past two weeks I have been traveling the US giving presentations and visiting with friends. Starting in Michigan at the Midwest Sled Dog Symposium and most recently in La Pine, Oregon at the Arctis Cart-sponsored event, "Wild and Free Weekend". This was an amazing event! I was able to meet some of our biggest supporters and fans and their amazing dogs! I've been missing the hell out of my four leggers so this event gave me a chance to run dogs and be around super doggy people which was awesome medication to get me through the next week before I head back home to the dogs in Eureka. Big thanks to Henning Bartel for hosting and to everyone who came and ran dogs and showed their support of Wild and Free! I am spending the final week with family here in MN. My little sister Melissa gets married on Sat. which is bringing my whole family together for the first time in 5 years! We are all very excited! I am very lucky to have a great crew of friends and handlers in Eureka holding down the fort and training the dogs while I am away. This is no small task! Mandy, Travis, and Jannelle are doing a great job and so far everything has gone smoothly. As much as I have enjoyed this trip I am eager to get back home and get back to my life with the dogs. Being away really makes me realize how much I love my dogs and my life in AK. I am really looking forward to getting back and diving right back into training. The dogs and I have a big season ahead of us and I am excited about what we have on the schedule. We are already signed up for the second running of the Top of the World 350 which will start on on Dec. 27th in Tok, AK, and our 8th go at the 1000-mile Yukon Quest which starts on Feb 1 in Fairbanks, AK. We are also planning on signing up for the Copper Basin 300 which starts in Jan and we are currently putting all the pieces together to sign up for our 3rd Iditarod!! I am very lucky to have many supporters and sponsors and it is because of them that I am able to get to the start line of our races each year. This year thanks to one of our sponsors we have a great fundraiser underway to raise money for our 2014 Iditarod. "Attitude is Everything" is one of my mottos and one that I try and live by everyday. So much so that I have it tattooed on my left arm to always remind me of this simple but very important message. Becky of 5-Sibes Sewing took the design of my tattoo and made 100 patches and donated them to Wild and Free. We are very thankful for this sponsorship and decided to use the patches to help raise money for out 2014 Iditarod. We are selling the patches for $50 donation to our Iditarod fund. With your donation comes a Attitude is Everything Patch, a Wild and Free patch and an entry in a drawing to win my signed Iditarod bib, signed booty used on the trail and a Wild and Free pint glass. We kicked off the fundraiser 2 weeks ago and are well on our way to to selling all 100 patches. To learn more about the fundraiser and get your patch see the front page of our website: www.wildandfreealaska.com. Since we kicked off this fundraiser I have gotten a lot of questions as to where the design came from and why I got the tattoo. It is a great story that I will share with you now. In 2010 I was working at Trail Breaker Kennel giving sled dog presentations. We had several groups a day come through, and I would share stories and talk about my experiences on the trail. One day after giving one of my talks I had a gentleman and his wife come up to me and thank me for my presentation and ask me if I would accept a gift from him. I said sure, with some curiosity wondering what he might be about to give me. As he reached into his pocket he asked that I would carry this this with me or at least keep the message that this gift represented close to heart. I said sure, not knowing exactly what he was about to give me. 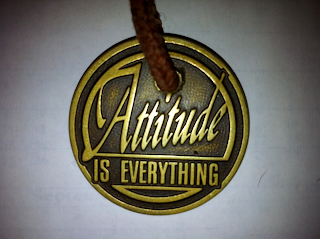 Out of his pocket came a medallion about the size of a silver dollar that said "Attitude is Everything". He proceeded to tell me that he had been carrying this medallion around in his pocket for the past 30 years as a constant reminder. I looked to his wife who was almost in tears, she said that she had watched him put it into his pocket every morning and could not believe that he would part with it. He said that my presentation, where I had emphasized how important attitude is when working with sled dogs, inspired him to pass it along in hopes that it would help me along in my life like it had in his. Wiping a tear or two from my eyes I took the medallion from him and said I would be honored to accept the gift. This day changed my life. I always knew attitude was important, but after receiving this gift and visiting with the gentleman who was a farmer from Nebraska and seeing how much this medallion and more importantly this message had affected his life, I realized just how important having a positive attitude really is. Whether you're farming in Nebraska or mushing dogs in Alaska, with a positive attitude you can accomplish anything! That night I drilled a hole in the medallion and started wearing it around my neck because I knew that I would lose it if I attempted to carry it around in my pocket. After wearing it for nearly 2 years I decided that I needed a permanent reminder. Because the medallion was a piece a metal and was pretty cold to wear around my neck during the winter in AK, I decided to get it tattooed on my arm. 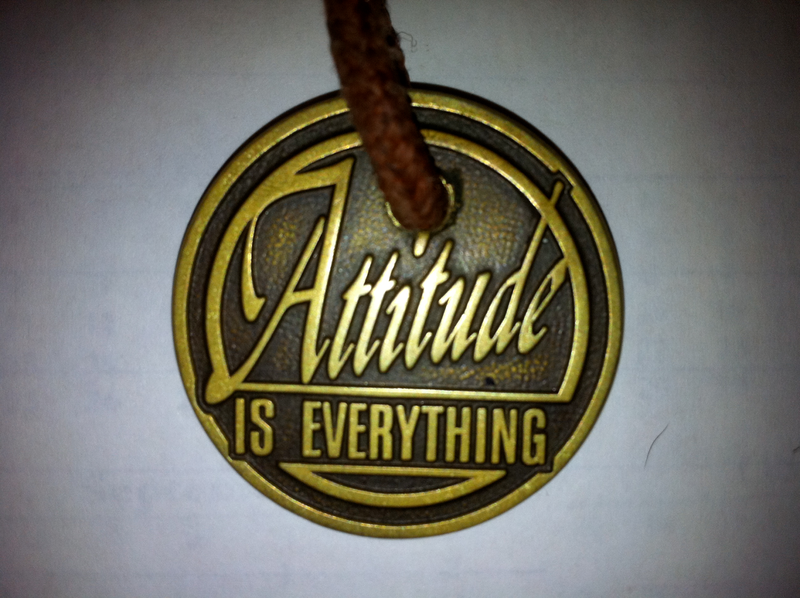 Ever since the day the farmer gave me that medallion "Attitude is Everything" has been my motto and something I strive to live by everyday. I have shared this story with thousands of people young and old and will continue to in hopes that I can help change someone's life with this message the same way that the farmer from Nebraska did for me. I took the pic below when I was crossing the sea ice between Shaktoolik and Koyuk during the 2013 Iditarod just one of the many times the tattoo has come in handy! Stay tuned for more updates and stories from Wild and Free. We have a very exciting season ahead of us and hope you will follow along as we make our way down the trail!